Training your dog to eliminate outside or in an appropriate indoor area is one of the most important behaviors on an owner's list. Elimination is a normal and rewarding behavior for your dog. I have to “go” is followed by I “went” and now I feel better. A dog needs to be taught it is rewarding to eliminate outside and/or in an approved area. Punishing a dog for accidents should be avoided as it only teaches them to not eliminate in your presence. Supervision and observation are very important in house training. It will take time to house train your puppy and how long it takes is directly related to how well you supervise him. Both puppies and adult dogs can be house trained. While the training steps may be the same, please note that puppies can only hold their urine for about an hour plus his age in months. So a puppy who is two months old can hold it for about 3 hours maximum. Every dog will be different and activity level, size and development all effect how long before a dog has full bladder control. Your puppy will need to eliminate after he eats, drinks, plays and wakes up. Feed your puppy multiple times a day for a set amount of time (for example, 20 to 30 minutes) and then remove any uneaten food. Water should be available at all times. Maintain a consistent feeding schedule which can help regulate the elimination schedule. Watch for your puppy’s signals that he needs to go – sniffing, circling, approaching the door – and take him out. If you take your puppy out and he urinates but you know he usually has a bowel movement during this time wait and give him time to finish. If he doesn’t go in several minutes take him back inside and watch him closely. Try again in a few minutes. The dog should be supervised as much as possible during house training. You or a member of the family should be assigned to watch the puppy. That person’s responsibility is to be watching the puppy and taking him out as needed. If you need to be doing other things while watching your puppy tie a 6-10’ cord around your waist with the other end attached to your puppy. 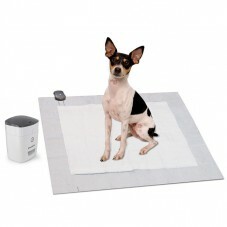 You will be able to go about life and supervise your puppy at the same time. You will not be able to watch your puppy all the time. During the times you cannot supervise, he needs to be confined. It is highly recommended you purchase a crate for your puppy and follow the rules for crate training. Your puppy’s crate is a “safe place to call his own”. It is his natural instinct to keep his area clean and this can be utilized during the house-training period. Never force your puppy to eliminate in his crate by expecting him "hold it" longer then he is physically able or he may lose the natural instinct to keep his area clean. The area should only be large enough for your puppy to stand up, turn around and lie down. If the crate is larger than this, block part of it off until your puppy grows and or he has full bladder control. Always go outside with your puppy on a leash. Indicate when you are taking him out by saying, “Let’s go out” and take him to the area you prefer he eliminates. Don’t play with him and give him attention until after he eliminates. If you notice he is about to go say something like, "Go potty” or "Get busy” just before he eliminates. This will eventually be his cue to eliminate. You need reward him the instant he eliminates and the only way you can is to be there when it happens. Reward your puppy with praise, a tiny food treat and some play time. Reward him every time he eliminates in an appropriate spot. There will be accidents during a dog’s lifetime. Don’t yell at or punish your dog for an accident. This could scare him or simply teach him not to eliminate when you are present. It won’t teach him what is correct. If you catch him soiling in the house cue him to go outside. He may stop and go to the door where you can take him out. If the “accident” happens anyway or you were not there when it happened don’t show any reaction to your dog. Clean up any areas where accidents have occurred with an odor eliminator/enzyme cleaner to remove any smell that may draw your puppy back to the area. Your veterinarian should be able to recommend a good product. 1. Leave your puppy in a confined area or room that is just large enough for sleeping, eating and elimination areas. 2. 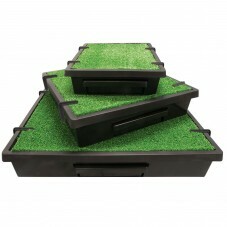 Indicate the elimination area with a litter box of sod (to mimic the outdoors/grass surface), or pee pads, newspaper, etc. if you can’t provide the box with sod. 3. Show your puppy the box or area after his meal or play to encourage this as an appropriate spot to eliminate. 4. Reward him for using this area. If your puppy or dog is not responding to the training or at any time regresses in their house training, please see your veterinarian for a possible health related issue. Can a Ride Save a Life? Potty Mouth: Is Your Pet House Broken or Inside Broken? Potty Train Your Dog the Easy Way! Where Does Your Dog Potty?